CNS (Citizen News Service): You can manage your asthma! Raashid is one of the 235 million people around the world who are affected by asthma which accounts for 1 in every 250 deaths worldwide. 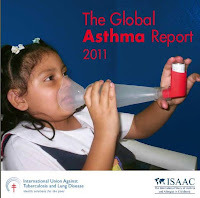 India contributes to 10% of the global burden of asthma, with around 3% to 5% of its population being asthmatic. Childhood asthma incidence in India ranges from 2.1% to 11.8%. The word ‘asthma’ comes from a Greek word meaning ‘panting’ or ‘breathless’. It is a disease of the bronchial tubes (called the airways) that typically presents with “wheezing”, shortness of breath and/or coughing, particularly in children, which are caused by the allergic reaction between a trigger allergen that enters the body and the antibody called the IgE (Immunoglobulin E). This leads on to inflammation and narrowing of the airways, causing spasm difficulty in breathing. The truth is that properly dosed inhalers and do not cause any side effects. Inhalation therapy is a targeted delivery of the drug to the lungs and it does not go to any other body organ. In oral medication only 1% of the drug goes to bronchial mucosa and the rest goes to other parts of the body through blood system causing severe side effects. Secondly in inhalation therapy the dose is very small (in micrograms), whereas in oral medication it is of the order of milligrams. The Union has worked with the International Study of Asthma and Allergies in Childhood (ISAAC), a research network established more than 20 years ago. It has also established the Asthma Drug Facility (ADF) as a procurement mechanism to provide quality-assured essential aerosol medicines, used routinely in the treatment of asthma, at reduced costs. Since 2010, the ADF has successfully delivered inhaled corticosteroids at low prices to countries in Latin America, the Middle East, South-East Asia and Africa. i've just now found out that i've had untreated asthma which has caused me to have shortness of breath and wheezing or chest pains, i didn't discover that i had asthma until this year (i'm 15 years old) , i play basketball.